Renate Aller’s dynamic compositions are rich with implied narratives, and the photo- graphs in her Mountain Interval series are the fullest expression of her exploration of the interrelationships of romanticism, memory, and place. Capturing the most celebrated and challenging mountain ranges across six continents, photographing while standing at elevations as high as 22,500 feet, her pictures present vistas that are forbidding yet strangely intimate, and never exactly what they seem at first glance. Aller’s mountainscapes are generally displaced from contextualizing surroundings or perceptible human interaction. Each image acts as an individual portrait of rock and snow, at once familiar and enigmatic in its singularity. 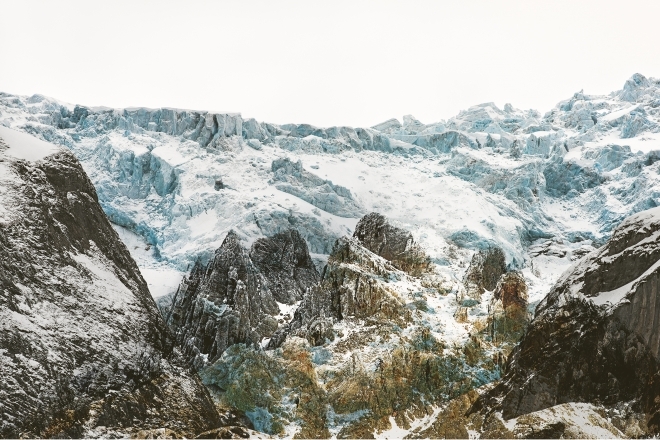 Certain of the places we see in her photographs don’t exist, however: these hybrid places are Aller’s own invention, separate mountain ranges layered one on top of the other by the artist to create an aesthetically compelling whole. Works like #1 – USA, Colorado, Rocky Mountains, Nov. 2015 | Swiss Alps, March 201 (plate 59) are identified only through the title notations of place. They present a new reality, a sort of deeply felt postcard from the artist’s imagination. One could say that Aller landscapes her perceptions—and ours—just as a gardener might arrange and juxtapose disparate elements in the service of a harmonious experience. In this context the word landscape functions also as a verb, describing actions taken for aesthetic improvement. Whether composed or straightforwardly recorded, Aller’s photographs convey a sense of transcendent grandeur that is inherent to the natural world. Calling attention to the importance of experiencing and perceiving nature, her work embodies the cultural historian Simon Schama’s observation that “there is a difference between land, which is earth, and landscape, which signifies a kind of jurisdiction. It always meant the framing of an image.” The word landscape, Schama continues, “originally came from the Dutch and had to do with making pictures. From the earliest time, it has been loaded with wishful thinking. All the images we have of Yosemite are of Edenic places. You never see people in Ansel Adams photographs or Albert Bierstadt paintings. The book includes 61 images from the Mountain Interval portfolio. Read the essay by Terrie Sultan featured in the book here.